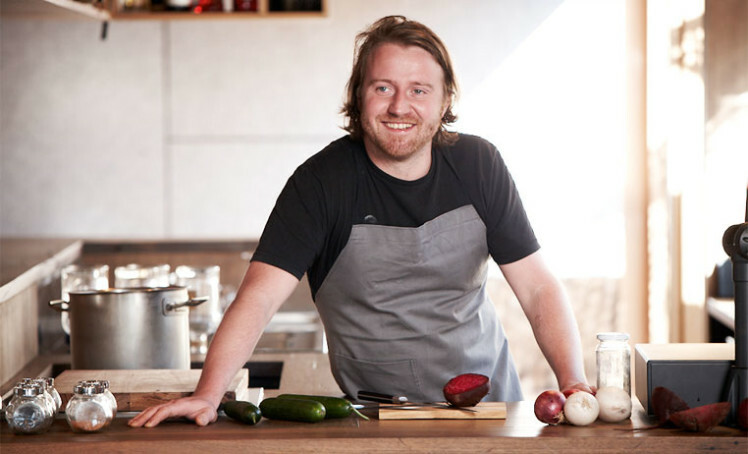 In the Melbourne foodie scene, where locally grown, carefully considered ingredients are of utmost importance to a meals success, Matt Wilkinson is kinda a big deal. If you live in Melbourne, or visit frequently, then you might be more familiar with Matt’s co-founded cafe Pope Joan in East Brunswick which really is a go-to haven for incredible and inspired food. You might have also been lucky enough to score a beautifully packaged jar of Matt’s chutney or sauce, under his label Mr Wilkinson’s at our Melbourne Finders Keepers market last year. In fact, he even had something nice to say about his experience. As you can probably gather, Matt is obsessed with growing, sourcing and presenting the best tasting produce he can. Matt demonstrates this passion in his second book, Mr Wilkinson’s Simply Dressed Salads, which follows on from his extremely successful first book, Mr Wilkinson’s Favourite Vegetables. Mr Wilkinson’s Simply Dressed Salads is divided into the four seasons: summer, autumn, winter and spring. Each chapter contains 13 stunning salad recipes that are both meals in themselves or fantastic as accompaniments that can be shared between family and friends. We are very excited to be able to share one of those recipes with you here on our blog, and as it has been taken from the Autumn chapter, we think it couldn’t be more appropriate! Put the cumin seeds in a small frying pan and toast over a medium heat for a few minutes, tossing regularly, until they smell fragrant. Tip into a bowl. Now toast the fennel seeds in the pan for a few minutes, tossing regularly, until fragrant. Add to the cumin seeds and lightly crush to release the flavour. In a large mixing bowl, toss everything together except the beetroot. Make sure the seasoning is right, the acidity balance is right, and the salad is dressed enough. Give it a good toss. At the last minute, add the beetroot (this is to stop the coleslaw becoming pink). Place in a salad bowl and serve. I have had many a good version of this coleslaw, with things added and taken away, but it has always been raw – no mayo or cream near it. A simple raw slaw. After reading that delicious sounding recipe (which we can personally vouch for! ), you’ve probably all been wondering – where can I get my copy!? 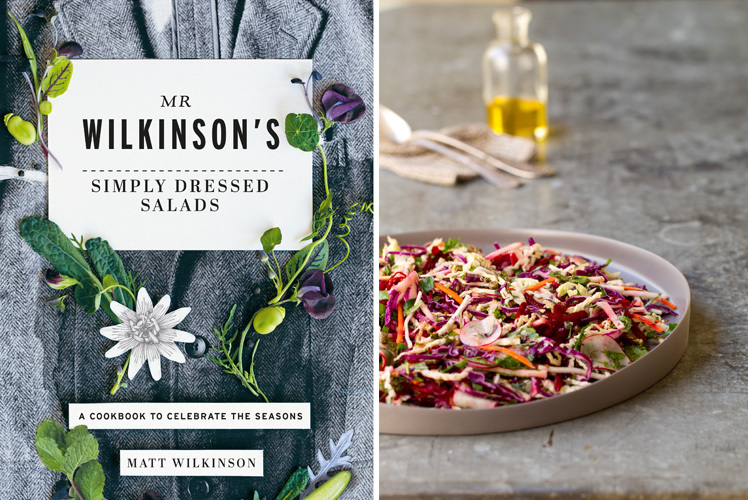 We are thrilled to be able to give away one signed copy of Mr Wilkinson’s Simply Dressed Salads to one of our readers! 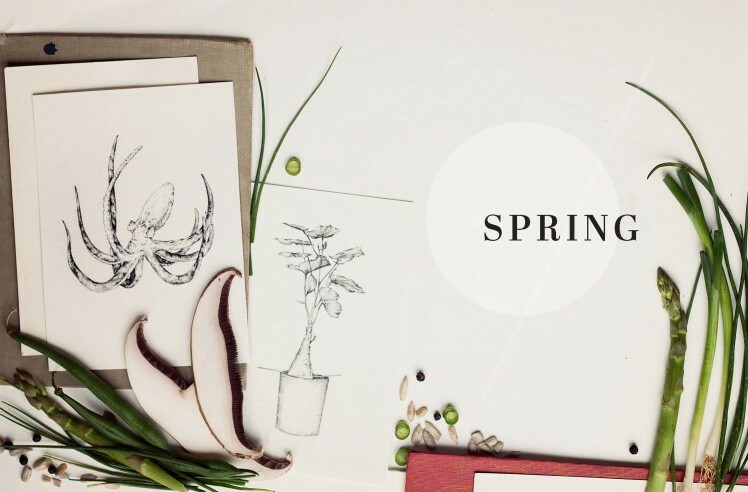 To enter this giveaway simply leave a comment on this blog post below, answering the question: “What is the best seasonal salad you have ever made?” Entries close midnight Thursday 26th March 2015 AEST, and the 1 winner will be announced (based on most interesting comment) on 2nd April 2015 here on this blog post and via email. This comp is now closed. The winner is… Emma-Lee Crane! Congrats. You’ll be emailed with more details about your prize. Thank you to everyone who entered, our mouths are watering with all those delicious salad ideas! You can also buy your own copy of the book online here or at all great bookstores. Terms & Conditions 1. One entry per person allowed. 2. To enter this giveaway simply leave a comment on this blog post answering the question: “What is the best seasonal salad you have ever made?” All comments are moderated, so it may not appear immediately. 3. Make sure to include your email address in your comment so we can contact you, your email address will only be visible to us and won’t be published online. 4. This competition is open to entrants in Australia only. 5. This competition is hosted by The Finders Keepers via our website thefinderskeepers.com 6. There is one price to be won, a signed copy of Mr Wilkinson’s Simply Dressed Salads book. Total prize value RRP AUD$49.95 7. Competition opens 9am Thursday 12th March 2015 and closes Friday 20th March 2015 AEST. 8. This competition is a game of skill and the winners will be based on the most interesting comments as judged by Hardie Grant books, and notified by email and via this blog post on The Finders Keepers on 2nd April 2015. Fennel and orange salad with a drizzle of Balsamic vinegar and olive oil is refreshingly appetising, healthy because you’re getting a fruit and a vegetable and simple to make. I love any salad I make with beautiful fresh figs when they are in season. My favorite combo is fig, rocket, goats cheese and walnuts dressed with a caramalised balsamic and finished with a crack of pepper. Yummmm. Sliced Tomato and Cucumber picked from my vege patch topped with some locally made Feta Cheese crumbled on top, and a splash of Balsamic….Fresh and Fabulous! Freekeh, black barley, grapes, toasted almonds and parsley. Squeeze of lemon juice, evoo, S+P. Us Syrians love a good fresh salad that’s high in protein! Beautiful truss cherry tomatoes, fresh basil, the best buffalo mozzarella torn over the top and drizzled with good quality balsamic vinegar. Simple Italian! Buon appetito! My favourite salad at the moment is couscous with cinnamon and cumin, mixed with baby spinach, red capsicum, cucumber, mushrooms, carrot, toasted pine nuts and some freshly cut pineapple! Delicious! My favorite salad is a summer salad with lettuce and white and yellow peaches. Roast pumpkin and rocket with walnuts and a honey miso dressing! Fresh mango with diced avocado and chopped macadamia on a bed of rocket leaves dressed with a balsamic vinaigrette – my favourite summer salad!